I picked up this 7″ while in Reykjavik a few weeks back, from none other than S.H. Draumur founder and all-around-Icelandic-music-expert Dr. Gunni. It’s beat to hell, as well it should be given that it’s a punk 7″ from the 1980s. I’ve written about S.H. 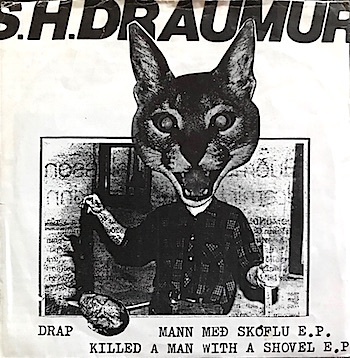 Draumur on the blog before so I figured I probably wouldn’t bother posting anything about this record (the title translates to Killed A Man With A Shovel). At least that was the plan until I listened to it. I’m not going to do a deep analysis of this three-song record, but I do want to leave you with one observation: It sounds like a sped up, punked out version of The Gun Club. 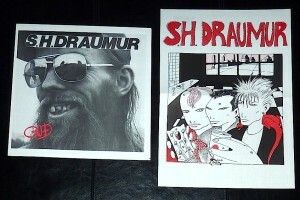 So if you’re a fan of Jeffrey Lee Pierce and the boys like I am, Drap Mann Með Skóflu E.P. is a must-hear if you can find a copy. I had my hands on a copy of Bless last November at Lucky Records when we were visiting Reykjavik, but somehow I convinced myself that I already had it. Needless to say when I got home and realized my mistake, I was pissed. Pissed enough to make it a point of immediately finding a copy online and buying it. That’ll show me (there’s nothing like getting back at yourself!). The infamous Dr. Gunni was the driving force behind S.H. 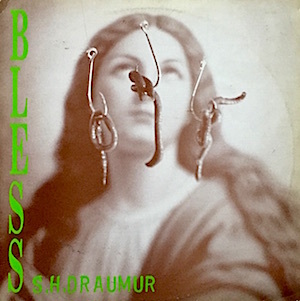 Draumur, releasing material under that moniker during much of the 1980s, with 1988s Bless ending their run of new material (compilations followed in 1993 and 2010). There are two different vinyl versions of Bless listed on Discogs, both released in Iceland in 1988 – a three song version, and a four song version (“Dýr Á Braut” is the additional tune). Images of the front covers of the two versions show the three song copy with an “E 21” at the bottom right of the front cover, which is missing from the longer version. It is also indicated that only the Erðanúmúsik label is associated with the three tracker, while the four tracker lists both that label and another Icelandic label, Gramm. I wanted to get to the bottom of this so I went right to the source – Dr. Gunni himself. According to the good doctor, the record only exists in a four song version. Unfortunately there aren’t any photos of the jacket reverse or center labels of the alleged three song version to offer any additional clarity. So, much like the Loch Ness Monster, Bigfoot, and gin that actually tastes good, this three song version will remain a sort of myth, something said to exist but probably not real. Musically Bless fits in with Gunni’s overall style – raw rock with doses of psych and even a little rockabilly. Gunni’s vocals are higher pitched than you’d expect, sometimes even going into a falsetto, other times a shrill wail. The music has an energy to it, played with both abandon and urgency, much like the other S.H. Draumur material I’ve heard over the years. I’m glad I was able to find it online and didn’t have to wait another 10 months to get back to Iceland to buy a copy. I’m not sure why I never got around to writing about this record before. I’ve had it for a while – I think it was part of the first batch of records I ever bought from Reykjavik’s Lucky Records, back when they were crammed into their tiny original store. My guess is I listened to it once and never got back to it. I’m not sure what prompted me to put it on today, other than that I’d just been playing some Tappi Tíkarrass and so happened to be perusing my Icelandic vinyl shelf. And much to my surprise, who’s voice did I hear coming out of my speakers on the very first song? Björk’s. Which was a surprise, because Bless was not one of her bands. In fact the front man of Bless is none other than Dr. Gunni, he of S.H. Draumur and a man who I’ve met and actually bought records from, and a number of his friends appear on Gums. In addition to Björk contributing vocals to “Worlds Collapse” and “Yonder,” her Sugarcubes bandmate and current Ghostigital frontman Einar Örn playse some trumpet on “You Are My Radiator” and none other than Óttarr Proppé of HAM and Dr. Spock fame appears on “Spidergod” (as the Spidergod himself). It’s a veritable collection of Icelandic all-stars from the period when it was released (1990). The lyrical content is all over the place, and certainly a bit odd – song titles include “The Shovel Of Love,” (burying a girl in a sandbox…) “Night Of Cheese,” (eating cheese and a bad relationship) and “The Killfuckman,” (murder, and possibly cannibalism) so you know it’s going to be different. Musically Gums is an interesting record that’s hard to genre-fy. It’s rock… but it doesn’t neatly fit into any of the normal subgenres. Maybe I should just describe it as “indie” and leave it at that. 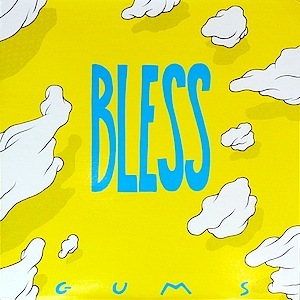 If there’s one band that Gums reminds me of, it would be Half Japanese, but Bless are much more talented musicians and Gunni, even with his unique delivery, is a better singer than Jad Fair. But there are some similarities, including the often bizarre lyrics. I need to give this one a few more spins. There’s a lot here to like. Just watch out for the killfuckman, or he’ll get ya. 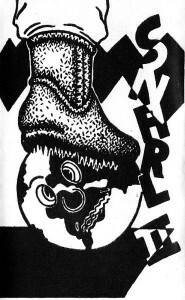 One of the top items on my Icelandic music want list was Snarl II, the 1987 compilation of punk/new wave music only released on cassette. The irony, of course, is that I don’t even own a cassette player, so it’s not like I could have even played it had I come across a copy. But that problem was magically resolved yesterday when I found out that Dr. Gunni posted the entire album on his blog, available for downloading free of charge. Thank you Dr. Gunni! Snarl II is packed full of music with 30 songs from 15 different bands. There were only a couple of groups I knew – Daisy Hill Puppy Farm, Sogblettir, Dr. Gunni’s own S.H. Draumur, and of course the Sugarcubes (live from the Hard Rock Cafe in Reykjavik, which we actually tried to visit on our first trip to Iceland only to find it had been closed… for about two weeks… Doh!). The tape has a bit of everything – punk, new wave, rockabilly, pop, and the just plain weird. There’s some great stuff on here. I probably should have waited until I’d listened to this multiple times before posting about it so I could give a more thoughtful review of the bands and songs, but frankly I was so damn excited to hear all this stuff for the first time that I didn’t feel like waiting. Look, I’m not going to dazzle you with my deep knowledge of musical terminology or break down the structure of the songs, so just trust me that this is some killer material and Holly and I both agree that the recording quality is pretty damn good given that it originated from a 26 year old tape. If you’re looking for a few recommendations, the Sugarcubes (listed here by their Icelandic name, Sykurmolarnir) are of course great, and I’m a big fan of S.H. Draumur. My favorite “new” bands are the very punk Mosi Frændi, the killer new wave of E-X (sung in English), and Qtzjí Qtzjí Qtzjí, especially their sort of Devo-esque song “Death” (I came to find out that these guys are also on the SATT 3 compilation). But don’t take my word for it – go download this for free right now (and also download the original Snarl album Gunni posted while you’re at it!). I mean, what do you have to lose? Only your self respect as a music fan if you don’t listen to this immediately. Just don’t let the power go to your head – I don’t want to hear about how you’re out there saying things like, “What? You haven’t ever heard Snarl II? It’s only about the best compilation ever to come out of Iceland,” while you’re rolling your eyes. With great musical power comes great responsibility. Choose wisely.